Patrick was born in Enaghan, Granard, however we are uncertain of the date as it appears that Patrick's military records have not survived. Patrick intitially enlisted with the Leinster Regiment, before transferring to the Royal Dublin Fusiliers, possibly in Glasgow, Scotland. He entered the war on the 9 July 1915 in Gallipoli. Patrick's sister Maggie was his next-of-kin. 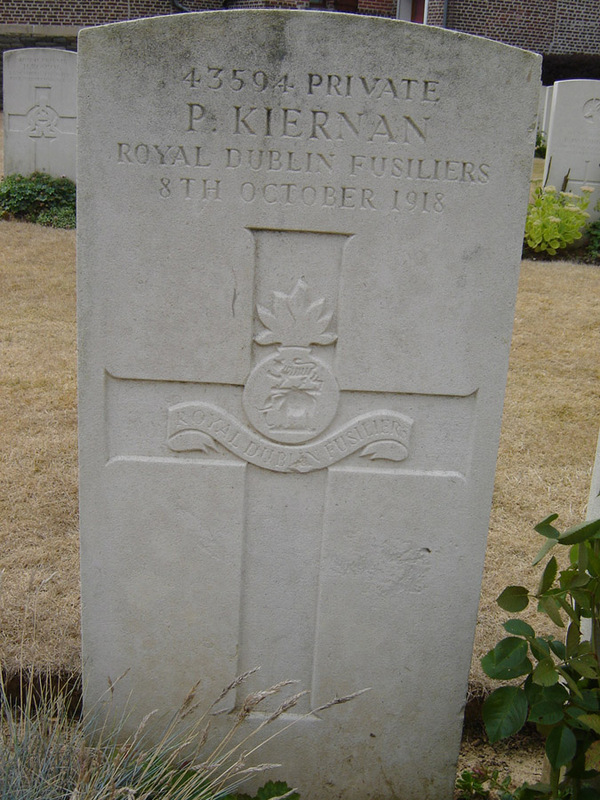 Patrick was either the son of James Kiernan and Bridget (née Geogan), born c. 18 August 1868; John Kiernan and Catherine (née Smyth), born c. 18 January 1879; or Bernard Kiernan and Bridget (née Mulligan) of Enaghan, born c.11 September 1886.